Waste management specialists HotRot Organic Solutions completed the construction of a new composting facility in Kingsnorth, Kent. The installation consists of two HotRot in-vessel composting (IVC) units for the treatment of sewage washings and the grits and screenings from sewage treatment works (STW) in the Thames and Southern Water regions. 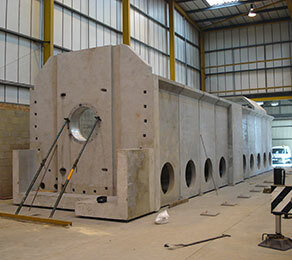 The composting units were constructed from precast segments which were assembled and then post-tensioned. CCL provided design advice for the post-tensioning, supplied the stressing system and carried out installation. Unbonded strand was fed through the cored sections and fixed at each end of the vessel using 12.9 mm barrels, wedges and specially designed anchor plates. Once the stressing was complete the strands were cut and the voids filled.